The Old Church House Inn in Devon, is it haunted? The Old Church House Inn lies 5 miles south of Newton Abbot in Devon. It's a beautiful and picturesque 13th century building, with the oldest parts dating all the way back to around 700AD. One of the more unusual features of the bar area, is that the wooden paneling that lines the walls behind the bar, actually originally belonged to a ship from the Spanish Armada. 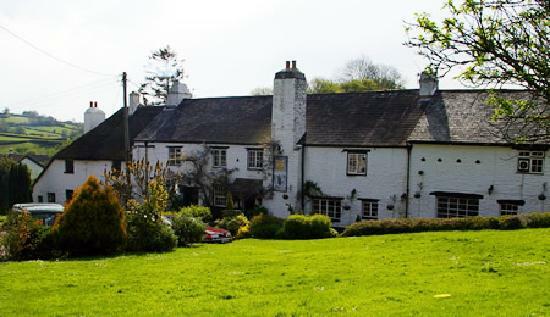 But perhaps the most famous story that surrounds this ancient Inn, is that of Bertie Robinson from nearby Ipplepen and modern literature's biggest mystery... Bertie used to drink regularly in this particular Inn, along with a man named Arthur Conan Doyle. It's said that Bertie Robinson actually wrote most of "The Hound of the Baskervilles" before Arthur Conan Doyle actually stole it and put his name on it. Staff at the Old Church House Inn actually claim that the phenomena is getting more alarming week by week. with deep sighs, footsteps and loud unexplainable banging noises in the many bedrooms. Unseen keys are often heard rattling and a dark monk-like figure has been seen ascending a non-existent staircase that was taken out years ago in the lounge. Perhaps the most terrifying story comes from a woman who staying in Room 1 during 1997 and awoke one night to see a disembodied arm pointing toward a wall, and the nearby church. Could this have something to do with a hidden tunnel leading to the nearby church?